Editor’s Choice: Impact of Social Sciences – The Historian’s Altmetrics: How can we measure the impact of people in the past? How can historians measure the influence of intellectual contribution over time? Scraping from online catalogs and employing a range of digital humanities tools, Michelle Moravec looks at women’s liberation scholarship and explores the relationships between authors and essays. It is important to critically examine why certain contributions appear in our web searches and others do not. In particular, she ponders what the messiness of certain datasets means for marginalized scholars. 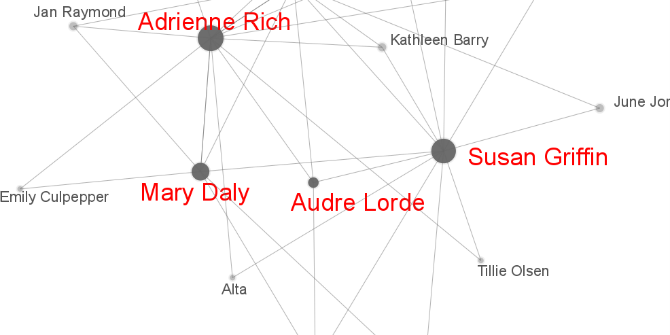 Almetrics is a buzzword I’ve shameless repurposed to give some cachet to my desire to find women who contributed to this academic artifact called “feminist theory” but who have largely been relegated to peripheral role in the history of its development. Having already done a highly subjective project in this vein, the current iteration takes up the question I posed at the end of Unghosting Apparitional Lesbian History. What about all the other Bonnie Johnsons? What would a historian’s altmetrics look like? How can we measure the impact of people in the past? My community clustered under what we call “women’s liberation” in the US is represented both in print and in person, I looked at anthologies from 1970, monographs from 1975-1981, an academic journal, and a central conference, The Scholar and The Feminist (1974-1984). In 1970 women’s liberation went mainstream, and publishing houses jumped on the bandwagon, offering not one, but four mass-marketed paperback anthologies. Of those, Random Houses’ Sisterhood is Powerful is the best known both for its slogan and iconographic cover. Leslie Tanner’s Voices from Women’s Liberation, which came out under the New American Library imprint, aimed more at the movement itself. Beverly Guy-Sheftell notes that the papers within “were read and circulated in women’s ‘consciousness raising groups.’”Voices from Women’s Liberation also explicitly connected women’s liberation to its historical antecedents and contained a considerable amount of material from the 19th century woman movement that Tanner hoped would correct the history “man” had “cheated” women of. Ace Books, a division of the soon to be defunct Charter Communications, published Sookie Stambler’s collection, Women’s Liberation: A Blueprint for the Future. All three of these white women were active in radical women’s groups in and around New York City when they put their anthologies together. Rivaling the influence of Sisterhood of is Powerful, was Toni Cade Bambara’sThe Black Women published by Penguin in 1970. Weary of hearing there was no market for books by Black women, Cade knew that the anthology would “open the door and prove that there was a market,” but she also wanted a book that would “fit in your pocket and be under a dollar.” While only Sisterhood and The Black Woman are still in print today, a quick search of Google books or the Hathi Trust reveals that essays from all four anthologies are still quite frequently cited. As one member of the founding generation of women’s studies, who also participated in women’s liberation, noted, these anthologies were “the required reading” for the first courses taught in universities across the US. By the time of my own women’s studies education in the late 1980s, they’d been reduced to slogans and buttons, although I avidly sought them out combing through used bookstores wherever I went. Through the years, as I moved, I schlepped them with me. I pulled my battered and torn copies of the shelf for this project. Impact of Social Sciences – The Historian’s Altmetrics: How can we measure the impact of people in the past?.